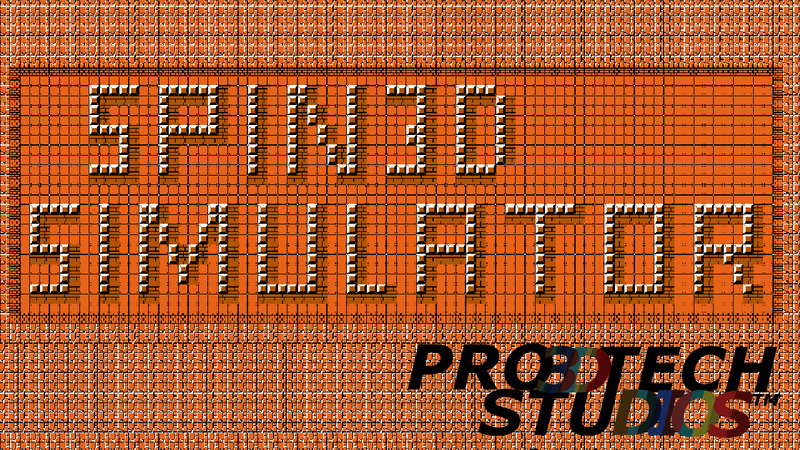 Spin3D Simulator is a small game that I was developed under the pseudonym of “Pro 3D Tech Studios”. “Spin3D simulator” is an small and absurd game, nothing too serious, this is just the result of investigating with the 2d physics of unity3d engine, nothing complicated (I barely know programming). But the result is fun! I maked a fun experiment with physics, why not try to make a simple game with this same funny physics? For this reason, I decided to use a pseudonym, and I use this game to be critical with a few “vices” of the small video game industry, that industry that we call “indie” games. In fact, Spin 3D simulator is a game I was working just a week. Obviously this is a free game. Why “Pro 3D tech studios? why “Spin3D Simulator”? I think the indie video game industry has any defects which, in my opinion, are quite worthy of criticism. From some indie video game development companies want to give the feeling of being very ‘professional’, function as a large company, mimicking the appearance of “high-tech” and “big-budget”. Why so serious? The result is almost tragicomic, they don’t have as many resources, or neither economic materials such as large companies. Therefore the result tends to be pretty mediocre and pointless. Being too ambitious is one of the worst mistakes that can make an indie studio. We are small developers, humility is for us, therefore, a virtue. Do things with little money but with love. Therefore, I think that the “Pro 3D Tech Studios” is the name most absurd and funny for one of those indies companies ranging from “high tech”. “Spin 3D simulator” name comes forward with that same joke. “Spin” is because the game is really based on spinning, is a game in which the physics made everything turn and turn without stopping. 3D continues with “Pro 3D Tech Studios” joke, perhaps 20 years out 3D technology was synonymous with high technology and quality, but now really isn’t, however many video game developers teams continue to talk about 3D as if it were “the future”. In “Spin 3D simulator” the word 3D is simply absurd, has no sense, because it is a 2D game, but well, if it appears “3D” on the title, should be a good game, wasn’t as well? Finally “simulator” is the buzz word, if a game use in its name the word “simulator” will be a success, would be a stone simulator, mountain simulator, bread simulator… It is the fault of the youtuber phenomenon and I have a game for be a youtuber phenomenon. This is the recipe for be the trend game in youtube: simple, silly, fast do, and carries the word “simulator”. But I’m going to break a rule, nobody wants to make a bad game, but there are people who only fame. I do not, that is one of the reasons why I used a pseudonym. That Yes! my game may be simple, but I hope at least fun.